This classic drill works on the swing from waist height to waist height, or as some call it, 9 to 3. This drill works on the timing when the arms are doing the majority of the work as they transfer speed from the body to the clubhead. This drill is very versatile, and can be used to work on a lot of things around impact. The most common ways to use it is to work on the amount of rotation/side bend of the body, the direction and timing of the arm motions, and the adjustments the wrists have to make to square the club face. Some of the most common problems that show up in this drill are standing up and early straightening of the trail arm to help square the face or not having enough rotation and side bend to delay the straightening of the trail arm. These two often go hand in hand, but the 9-3 drill is a smaller version of the full swing, which gives you the opportunity to practice the release and impact and get a general sense of the proper body positions that you will want to use in your full golf swing. Hinge & Hold With Putter Using a flat-faced club to exaggerate the "ant-flip" feeling of the hands moving in and the club out. Leftward Hand Path - Pool Noodle A great drill for golfers that struggle with hooks & a flip-style release. Path For Contact, Face For Control Troubleshooting 101 - Is it a face or path issue? 9 To 3 - Down & Not Up A version of the 9-to-3 with an added emphasis on "flat-spot" length and arc width timing. Discussing the 3 Consistency Keys Understand how swing plane, flat spot length, and face to path control relate to consistency. Two Checks for Ulnar Deviation Understand the benefits of proper ulnar deviation and how to check for it. What If I'm Not Taking A Divot An simple method for monitoring the cause of thin iron shots. Myview - Impact MyView of a few great impact drills. 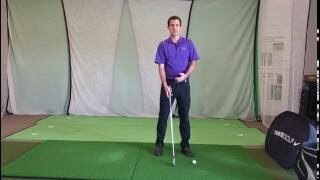 Tic-tac-toe - Training Impact Position This is a sequencing drill for practicing your impact position. Deconstructing The Arms At Impact Position This drills gives you an idea of where the arms will be at impact. You can use this arm position to help better understand what the body should do. Impact Drill Circuit A simple sequence of drills to practice a solid impact position. 9 To 3 Four Square - Driver Impact Path Training One of my favorite visual feedback drills for getting the club to swing on a shallow path.